It wasn’t long ago when eating at the mall meant a slice of pizza or a soft pretzel between changing rooms. Don’t get me wrong, Auntie Anne’s is the mall to a Jersey girl like me, along with Orange Julius and Cinnabon calorie splurges. While most of those options are still available, it adds a little special occasion feel to be able to toast the perfect wedding guest dress find with a nice steak and martini. The array of culinary choices has exploded at the Cherry Hill Mall and has been a key factor in raising the status of the retail center. It has come a long way from its inception in 1961 to include top department stores, boutiques and nine restaurants ushering in the inaugural Cherry Hill Mall Restaurant Week. While the new stores and air-conditioned space might seem like a no-brainer on sweltering days, the Cherry Hill Mall Restaurant Week debuts this July to breathe some life into what is regularly a slow time for the mall’s eateries. “Summer is slower than February at the mall restaurants. We wanted to create an event that would introduce mall visitors to what we have to offer,” said Robert Wahlquist, senior regional manager for the Pennsylvania Real Estate Investment Trust (PREIT) which owns both the Cherry Hill and Moorestown Malls. “With so many premier dining destinations in one location, Cherry Hill Mall is an ideal venue to host a restaurant week,” said Lisa Wolstromer, mall marketing director. “The quality of dining experiences complements our exclusive retail selection and we are looking forward to introducing an event that offers our shoppers an entertaining way to sample excellent cuisine. 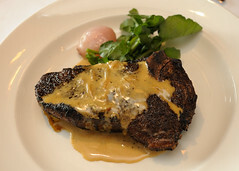 As host of the restaurant week’s kickoff event, The Capital Grille previewed items from both the lunch and dinner menus, and at the price of $18 and $35 I will be going back during the main event for at least one meal. 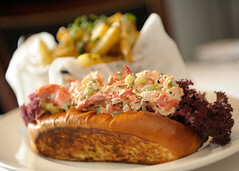 Standouts included a lobster roll that hit the right balance between savory dressing and letting the shellfish shine, pleasantly salted parmesan fries, a 21-day dry-aged Kona crusted sirloin crowned with shallot butter, and a flourless chocolate espresso cake so decadent it bordered on dark chocolate fudge. Executive Chef Kevin Kramer demonstrated a few recipes, including Seared Scallops with Israeli Cous Cous and Sweet and Sour Tomatoes, without revealing too many secrets. Note to everyone, remember to dry your scallops before searing and do not be afraid to add a little fat to your dish! Next week’s event will feature special prix fixe menus including a $12 burger, fries and soda combo from Bobby’s Burger Palace; baked to order dessert selections from Grand Luxe Cafe; and a three-course meal for two with two take-home pastas from Maggiano’s Little Italy. All menus can be view here. Restaurants: The Capital Grille *, Seasons 52*, California Pizza Kitchen, Maggiano’s Little Italy*, Grand Luxe Cafe, Bahama Breeze, and Bobby’s Burger Palace, Nordstrom Marketplace Cafe, and the Bistro at Cherry Hill Mall. * – Open Table reservations available, reservations available via phone for other venues. All photos: Copyright Gary Horn Photography. Colleen Wood is making food discoveries and retrying old haunts in and around New Jersey. She loves a good deal and learning how to make restaurant dishes at home. After spending her college years up at Boston University earning her journalism degree, Colleen returned to our great state as a marketing assistant by day and dance teacher and restaurant enthusiast by night! A foodie by birth, Colleen credits her mother for her love of good food and talent in the kitchen, and hopes they’ll one day get to open a bake shop!